For those of you who share my Biblical worldview, you will know why I am writing this post on this particular day. For those who are new to this perspective, or outright reject it, then simply regard this as a history lesson. In order to fully explore my premise, I must give you a bit of historical background. You may wonder where I'm headed with all this, but stick it out, and I think you will connect the dots. I was shocked when PLW pointed me to an article on the BBC News Magazine site, titled "The Greeks Who Worship The Ancient Gods." I urge you to read the entire article, and I hope to be able to inform you of the deeper significance of what will be happening in Greece today. In case you weren't aware, today, June 21st, is what is known as the Summer Solstice. You may think that only means that it is the longest day of the year; when the tilt of the Earth's semi-axis is in the southern hemisphere and our planet is most inclined toward the sun. But to followers of ancient religions, it is one of the most important days on their calendar. And it just so happens that there is a segment of the population in Greece who worship the country's pre-Christian gods. June 21st begins the Promethia Festival, which celebrates the ancient Greek hero Prometheus. It is also the most important annual festival for followers of The Return of the Hellenes - a movement trying to bring back the religion, values, philosophy and way of life of ancient Greece, more than 16 centuries after it was replaced by Christianity. Those with a knowledge of the Bible will recall the Hellenists, who battled both the Jews and the Christians in the arena of faith. For the Israelites, returning from exile in Babylon, they faced the threat of losing their identity in a new Greek empire and culture as promoted by the Hellenists. This led to the rise of the hyper-conservative Pharisees and their added, unnecessary laws. One of the ways Hellenism influenced Christianity was through Gnosticism. The Gnostic Greek philosophers taught that the earth was created not by the Most High God, but by an underling, several levels below, who imbued the physical nature of his creation with imperfection. The physical was seen as evil. Only the spirit was good. These beliefs manifested in several ways. If the physical is evil, then Jesus cannot be fully man and fully God; He either only appears to be physical, or He cannot be the Son of God. Similarly, if the physical is evil, there is no resurrection from the dead. Instead, "salvation" is reuniting in spirit with the High God. You can see how this line of thinking negates the full revelation of Jesus. What is being celebrated this very day in Greece is an attempted revival of this ancient belief system. To give you the full ramifications of this movement would take too long and probably be information overload. So I will try to show you why this seemingly innocent festival has a much deeper and dire meaning. That's why we need to look more fully at the historical implications presented in the Bible. Then I hope to show you how those facts play into what is happening in Greece today. If you know your Bible, you are familiar with the story of Nimrod, the ruler of Babel (ancient Babylon) as presented in Genesis 11. Unless you have taken the time to research different interpretations of the Bible and ancient texts, you may be unaware that Nimrod was the great-grandson of Noah. (I could really blow your mind by revealing the genetic makeup of Nimrod, but for the sake of our subject today, let's just agree that he was an evil person who rebelled against God). Josephus, the Jewish scholar, tells us that Nimrod rebelled against God because he hated God for judging mankind in Noah’s Flood. He set himself above the plans and purposes of God. You most likely know the story of the Tower of Babel -- which was an attempt by Nimrod to bring all the people together under one banner, speaking the same language, and to convince them that if they could build a tower high enough, they could reach the heavens, overthrow God, and become gods themselves. Well, we know how that worked for them, right? God squashed their plan, confused their language and scattered them over the earth. Now all these different groups spoke different languages and could not understand each other, lessening the chances that they could reunite as one rebellious nation. But perhaps what you don't know is that Babel indicates the god they worshipped; none other than Baal (also known as Bel). You might know Baal as an evil entity, but you most likely do not know that he was believed to be the son of El, the chief god. Starting to see Satan's plan to introduce a false concept of father/son worship? 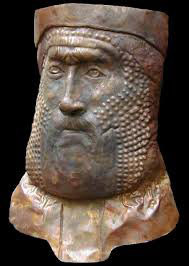 And Nimrod as the mighty king, was a true Baal worshipper, and an instrument of Satan. He is also considered to be the prototype of a rebellious people, his name being interpreted as "he who made all the people rebellious against God". After his death, Nimrod and his wife were confirmed by their priests as gods and his attributes were set forth under different pseudonyms. He has been worshipped throughout the centuries, and because the scattered inhabitants of Babel spoke different languages, he became known by these different names throughout different cultures and down through the ages. The ancient Greek and Roman gods, with names like Zeus/Jupiter, Hermes/Mercury, Hades/Pluto, Hercules, Apollo, Pegasus and Helios (the Sun God ... how appropriate for today!) 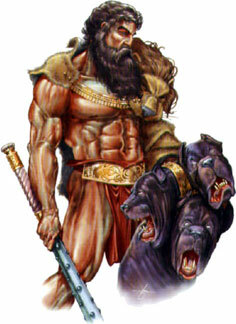 were all manifestations of the "mighty hunter" Nimrod. Indeed, the "Spirit of Nimrod" has been displayed in rulers like Oden of the Vikings, the Pharaohs of Egypt, the Kings of Assyria, Babylon, and Persia, Alexander the Great, Julius Caesar, Genghis Khan, Napoleon, Stalin, Hitler and Mao Tse Tung, to name a few --- they have all followed Nimrod’s path to power and bowed at his altar. The Nimrod Spirit comes upon those who want to rule over other men, establishing tyrannical government and putting themselves above God and His purposes. The Nimrod Spirit deceives the followers of the Tyrant through a false religion such as paganism, or a false philosophy such as communism, which legitimizes the power of the Tyrant. For those who are not deceived, the Hunter rules through fear and terror. Whew! That was a lot of information! But it brings us right back to my original point concerning the Summer Solstice. This group in Greece -- this group that wants to bring back the religions of ancient Greece bear a great resemblance to their ancient ancestors. Over the course of the three-day event, there are public prayers, two marriages, and a naming ceremony, where followers choose an ancient name - like Calisto, Hermes or Orpheus - and "cleanse" themselves of their modern Christian ones. They make statements like "It's going back to the roots. It makes me feel the continuation through the millennia." They offer sacrifices of flowers and fruit in simulation of the animal sacrifices made in ancient Greece. They focus their worship on the 12 main gods of ancient Greece and consider their country under Christian occupation. "When Christianity came in, it claimed it was unique - that there was one God, and all the other gods were false gods, and therefore had to be banished." 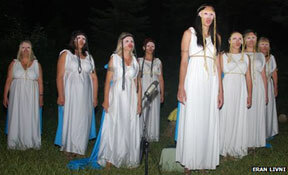 They dress up in togas with wreaths in their hair and by all outward appearances are a benign group. But it is their willingness to embrace ancient religions that makes them so susceptible to the ancient deception. In fact, this group states that their movement "is simply an acknowledgement of the gods, in the hope that the gods will help you." So if they are simply paying homage to their history and cultural rituals -- why would I find that disturbing? True, they are very likely unaware of what they are doing, but by bowing to the altars of Apollo, Zeus, etc., they are unwittingly bowing to the Satan-inspired spirit of Nimrod. Ignorance of who you are worshipping plays right into Satan's hand. These people have no idea of the fire they are playing with. These gods are not just fables and fairy tales. The worship of these entities is rooted in pagan worship of evil idols, which always leads right back to Satan's plan of deception. But people are so hungry to connect; to identify with any group that promises renewal and rewards and a sense of "belonging". It can start out being hopeful. Just look at how Hitler was able to deceive the German people. So, yes, you might think that this group celebrating the Summer Solstice is harmless, but I really think that if you open your mind, you can see this same scenario repeated from the beginning of time. It starts out innocently, and then ..... "In the beginning, they were making jokes, then they were ignoring us, now they are interested," says tax manager Persis Argyros, who has been involved since the start of the movement. "We became too big to ignore." And that is what worries me! Deuteronomy 12:30-31 "Take care that you be not ensnared to follow them, after they have been destroyed before you, and that you do not inquire about their gods, saying, ‘How did these nations serve their gods?—that I also may do the same.’ You shall not worship the Lord your God in that way, for every abominable thing that the Lord hates they have done for their gods .... "
My Pastor has often said "when you reject the truth, God's word, the only thing left to believe is the lie." And they will flock to the lie that teaches them they are their own god .... it began in the Garden of Eden.